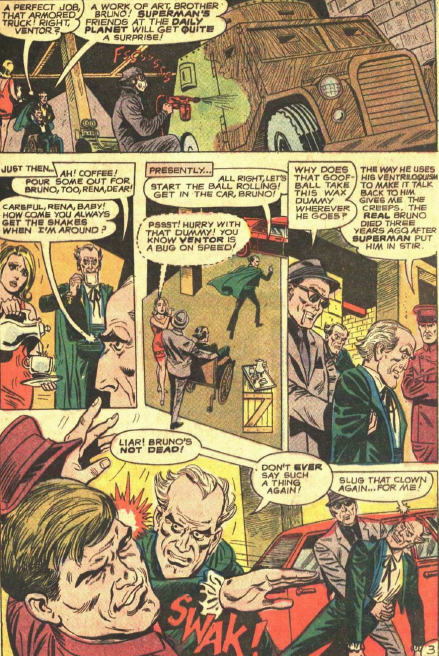 Binder, Swan and Abel conclude the Anti-Superman Gang’s plans in Action 377 (June 1969). 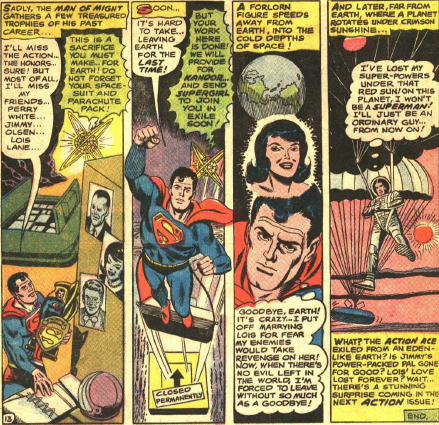 To get away from the kryptonite-spewing satellite, Superman flies down and into the Earth. He finds more lead, and makes another suit. 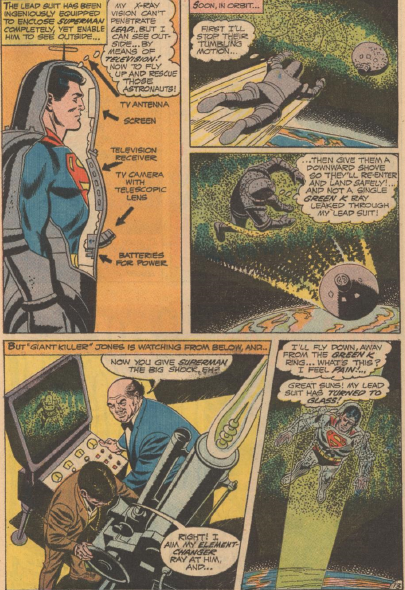 Once again the Gang uses the element-changing ray on it, but this time Superman follows the ray back to its source. 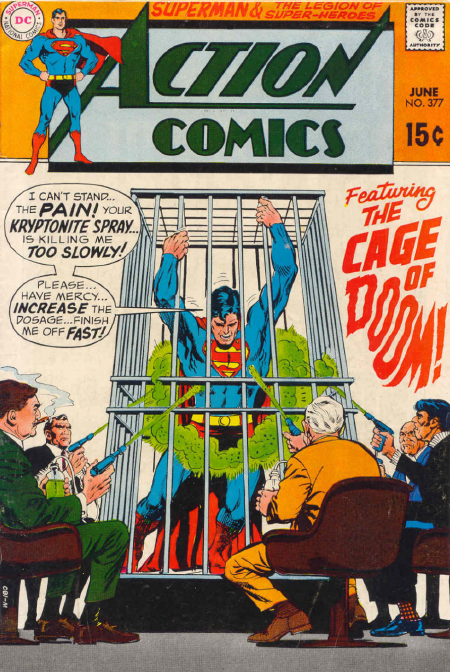 There, the Anti-Superman Gang captures Superman, using more kryptonite, and stick him in a kryptonite cage. 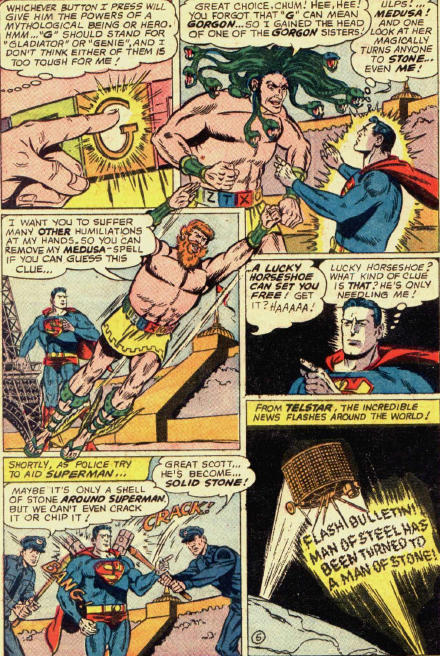 Superman bursts free, claiming to now be immune to kryptonite. In reality, he is just wearing a flexible lead-glass outfit to protect himself. 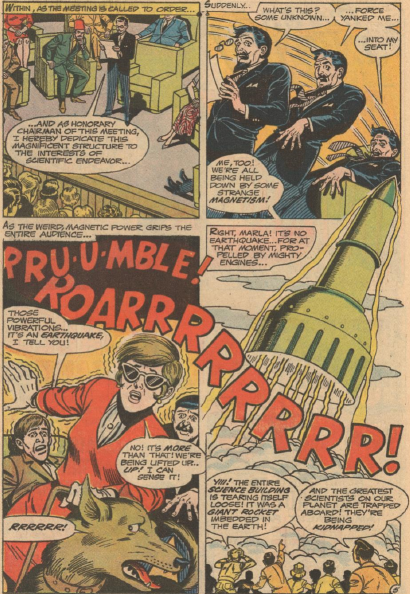 Although the Legion of Super-Heroes series technically begins with this issue, the story is a reprint of their first solo tale, from Adventure Comics 300. 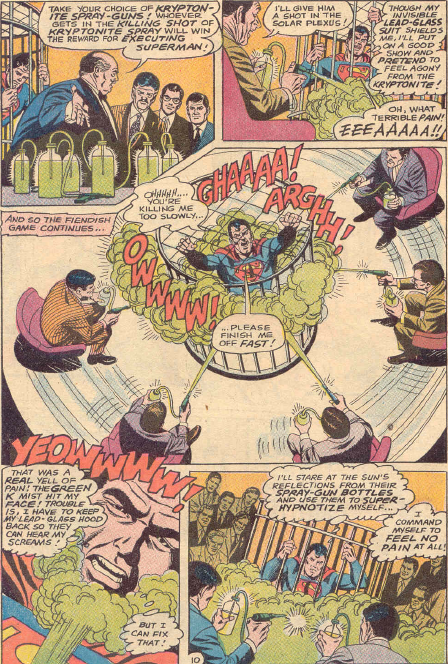 The Anti-Superman Gang debut in Action 376 (May 1969). 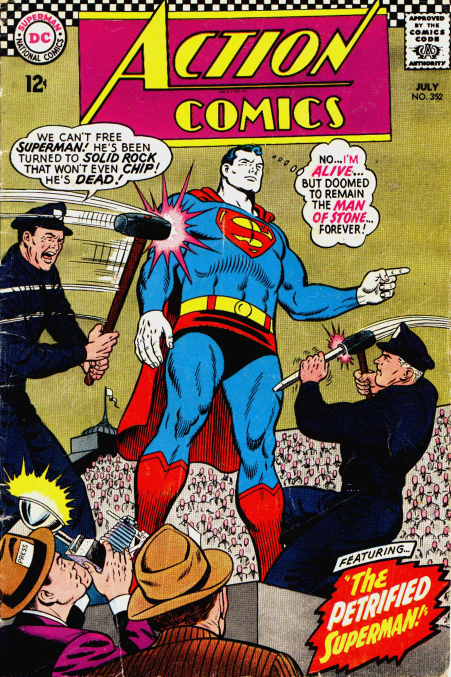 They are kind of like the Superman Revenge Squad, in that they come up with really complicated ways of killing Superman, except they are all human criminals. 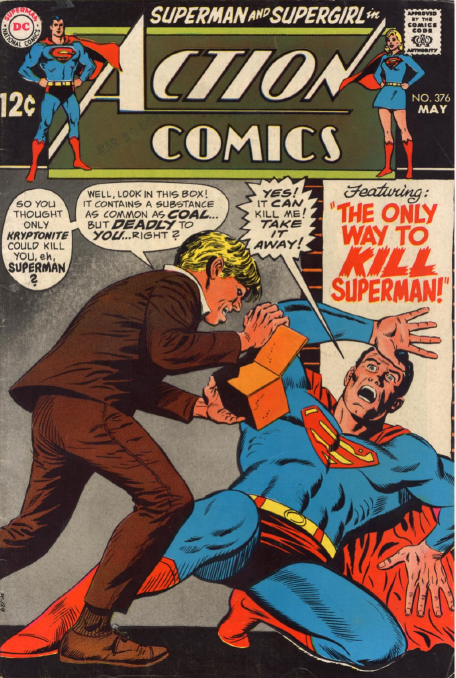 Throughout this story, by Binder, Swan and Abel, they try out a number of methods of killing Superman, with very little success. 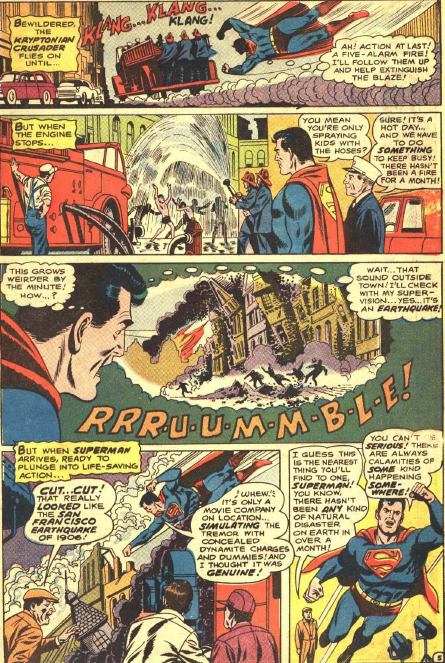 So little that Superman doesn’t even notice what is going on. 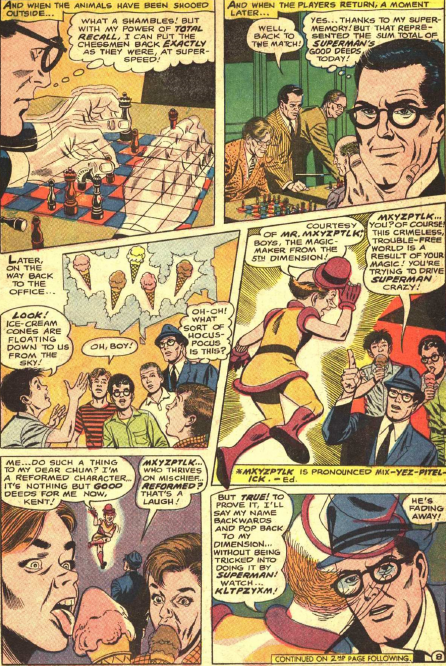 The attempt to kill him using his own costume moves the story almost into farce. Finally, a serious effort is made, with a satellite spreading kryptonite. 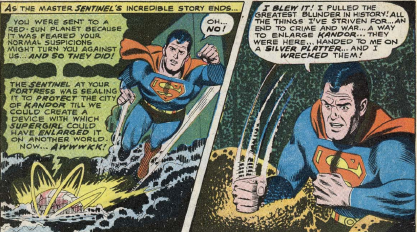 Superman dons his old faithful anti-kryptonite suit, but the gang has planned for that, with an element-changing ray that turns his suit to glass. 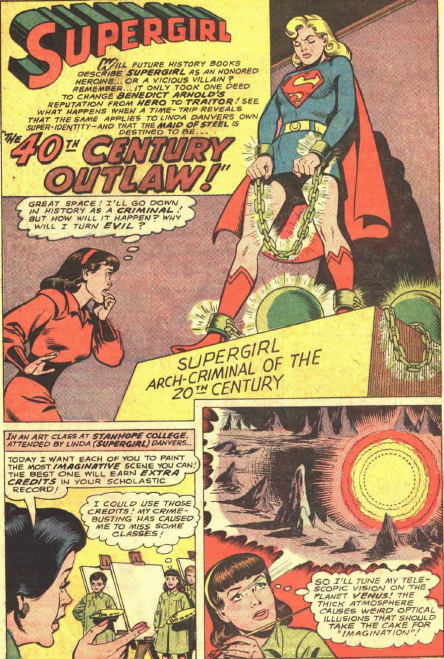 Supergirl’s long run in Action Comics comes to a close with this story by Leo Dorfman and Kurt Schaffenberger. 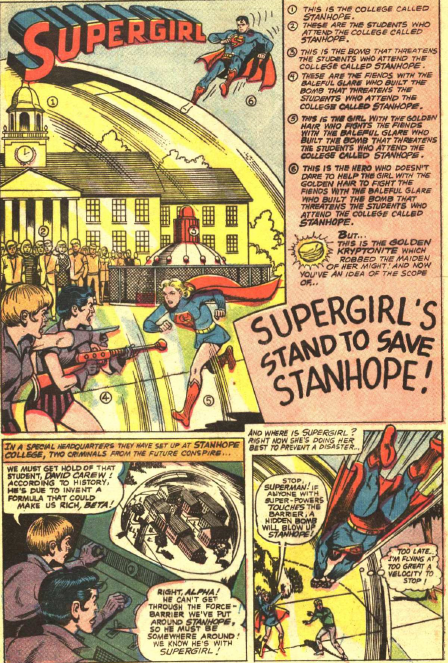 Supergirl gets blamed for an accident that robs one of Stanhope’s science students of her sight. 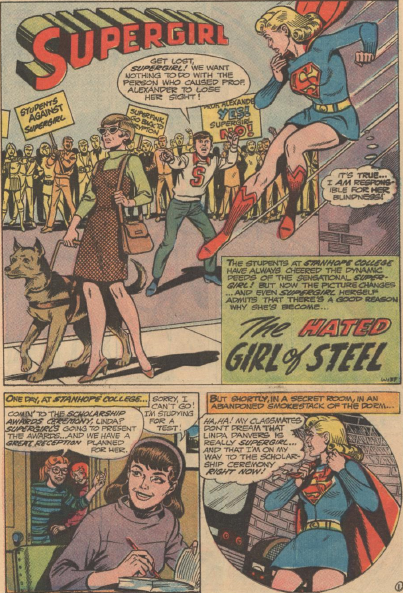 When Supergirl is unable to cure her blindness, the student body as a whole turn on her. But then some aliens steal the entire science department. It turns out the aliens stole the girl’s sight, and are now planning to steal everything in her mind. 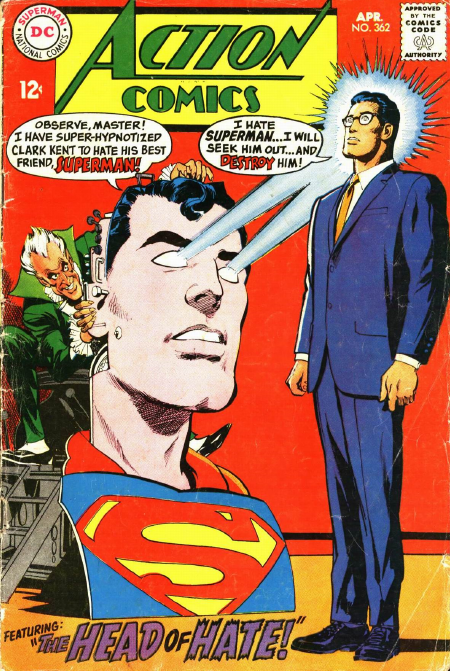 But their machine does not work, because Supergirl has taken the blind woman’s place. 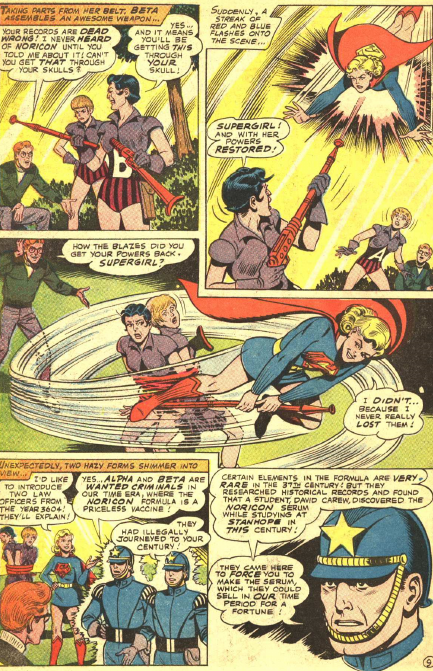 She defeats the aliens, and uses their tech to restore the woman’s sight. 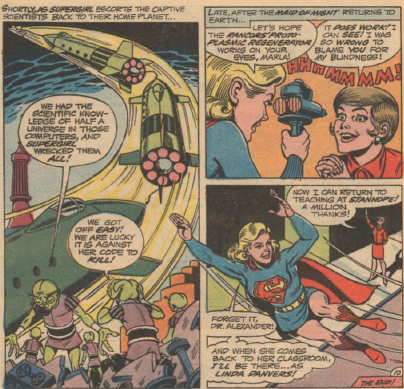 Not a great story, but Supergirl gets promoted anyway, moving over to become the cover feature in Adventure Comics, while the Legion of Super-Heroes get demoted, taking over her spot in Action. 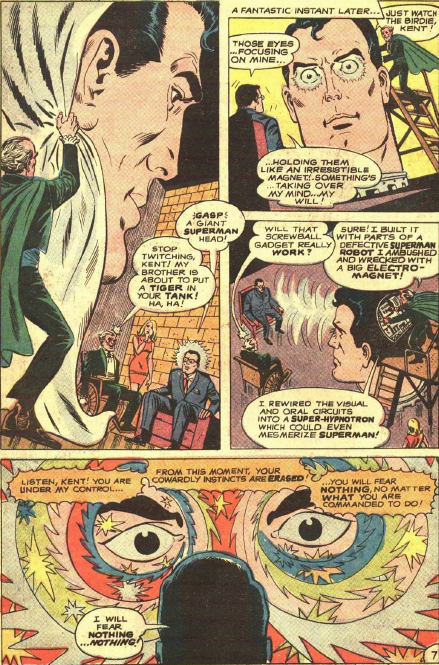 Binder, Swan and Abel conclude Superman’s troubles with the peace-bringing Sentinels in Action 369 (Nov. 68). 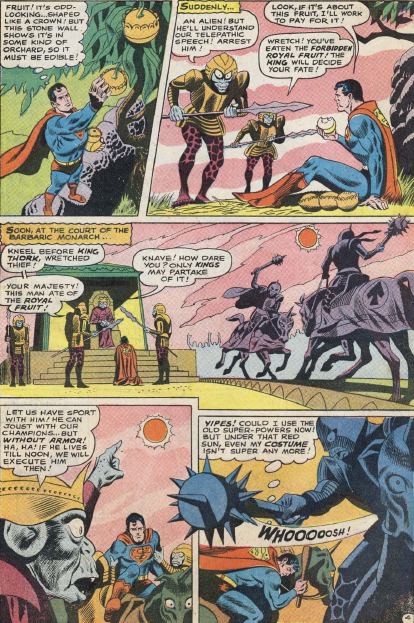 Superman discovers his world of exile is somewhat medieval, and definitely hostile. Things go from bad to worse for him, until the sun rotates. It’s half red, half yellow, in some physics defying situation. 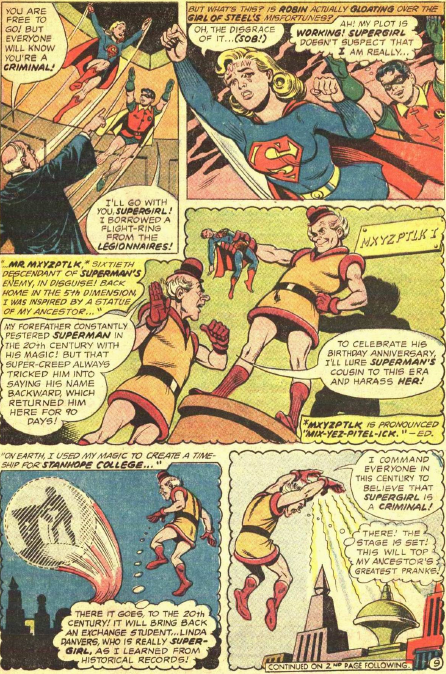 When the yellow side faces him, Superman regains his powers, and flies back to Earth. There, he discovers that the Sentinels have sealed off the Fortress of Solitude, and Superman worries that they will destroy Kandor. 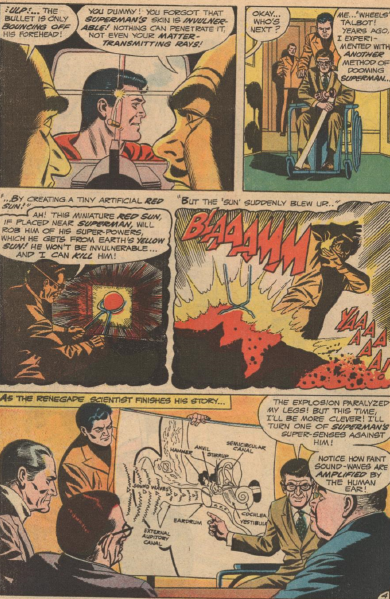 When he sees that the Sentinels are mechanical, Superman becomes certain that they are part of some plot against him, and travels the world, seeking out and destroying the devices. Only then does he learn that they were really working for the good of mankind. They knew Superman would suspect them, so got him off planet on purpose. They were working to enlarge Kandor when they sealed the Fortress. 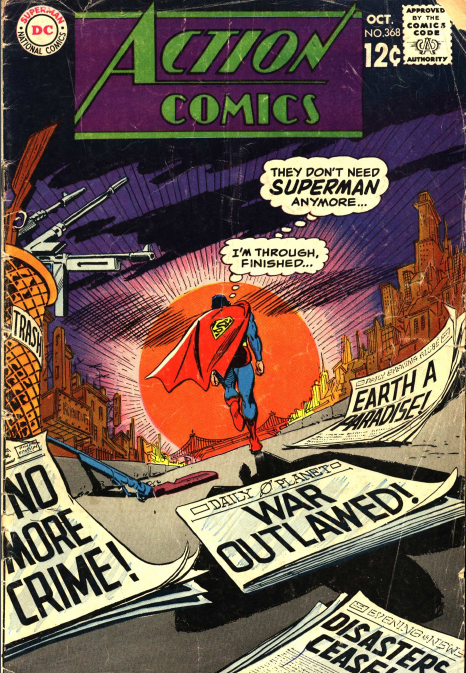 Had Superman not destroyed them, the Sentinels would have left Earth peaceful and safe. Not a bad story, could have had more impact, though. 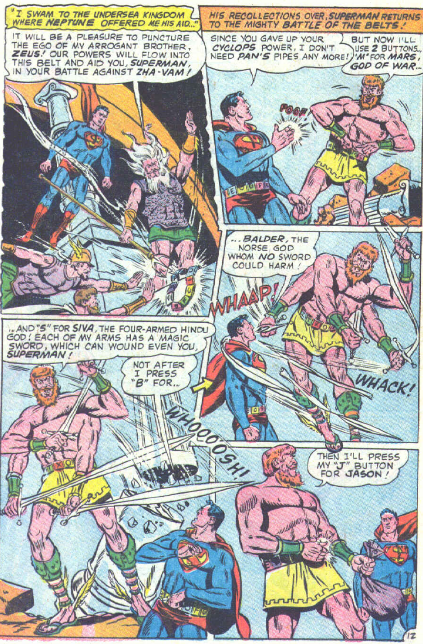 I don’t understand the purpose of having Jack Abel drown Curt Swan’s pencils with his inks. 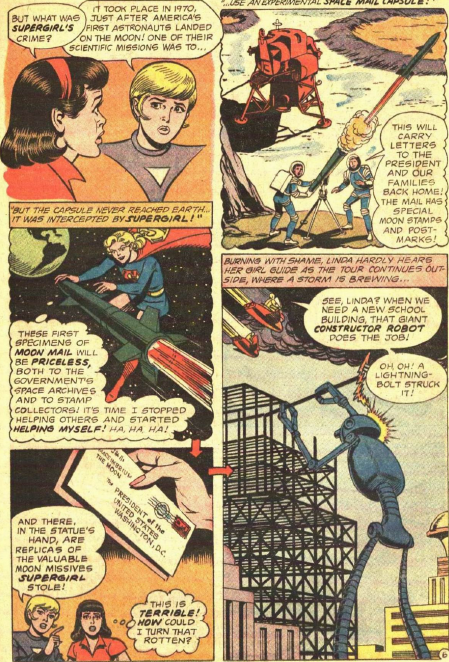 Binder and Boring bring their three part Zha-Vam story to a conclusion in Action 353 (Aug. 67). 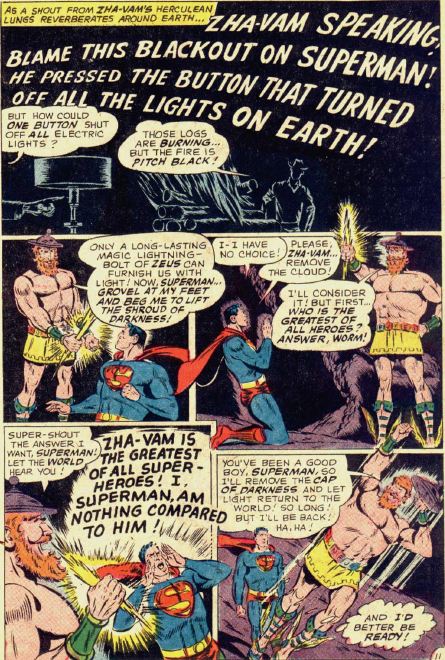 Superman figures that he needs to learn more about Zha-Vam in order to defeat him, and so he travels backin time to anceint Olympus, adopting the guise of a bard. He sees that the various gods form Zha-Vam out of clay, and endow him with their various powers. So he is actually a bit less of Captain Marvel, and a bit more Wonder Woman. 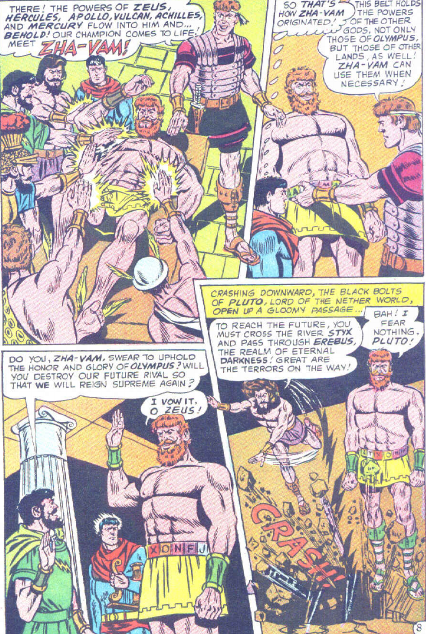 Neptune is jealous of Zeus and his powers, and so is eager and willing to aid Superman, giving him his own belt, and pantheon of mythological characters to draw from. 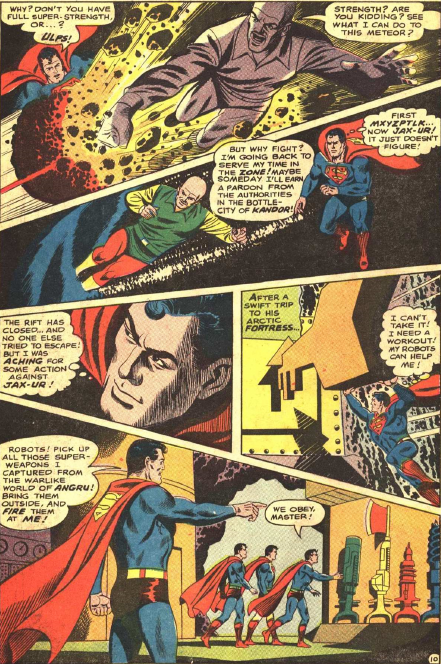 Superman returns to the present, and challenges Zha-Vam to a final battle. They are far more venly matched, as both can draw on magical heroes. 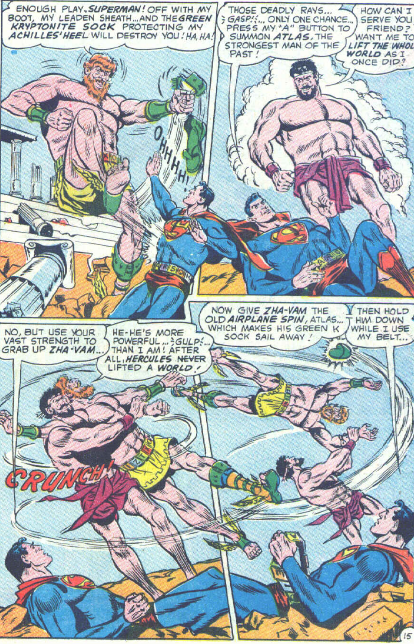 Superman calls up Atlas, and together they have the strength to defeat Zha-Vam. 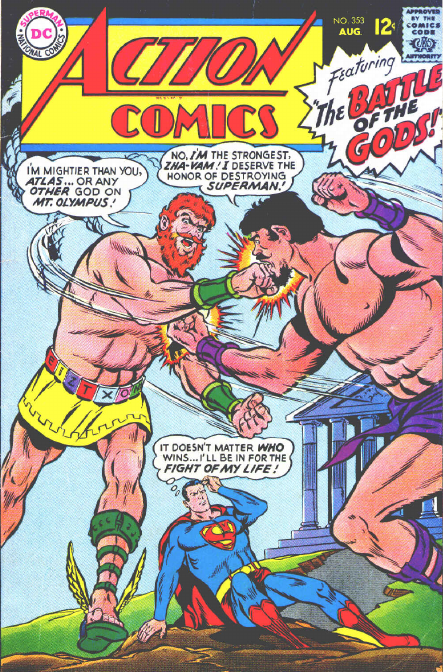 Superman brings the defeated being back to Olympus, and confronts the gods about their creation. Ashamed, they return Zha-Vam to the clay he was formed from. It’s not really a bad story. But all it really does is make one wish for an actual confrontation between Superman and Captain Marvel. 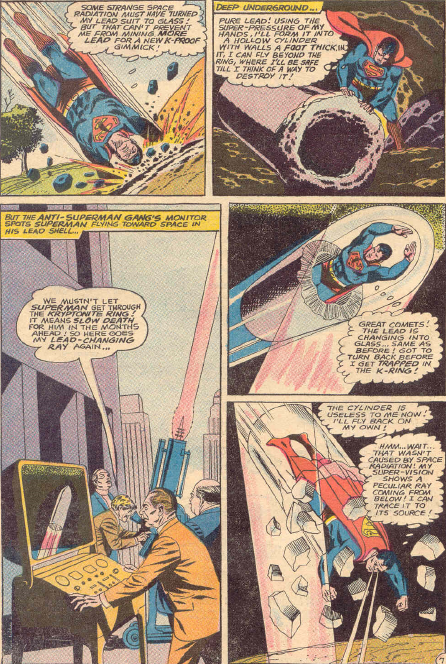 Binder and Boring continue the battle between Superman and Zha-Vam in Action 352 (July 1967). 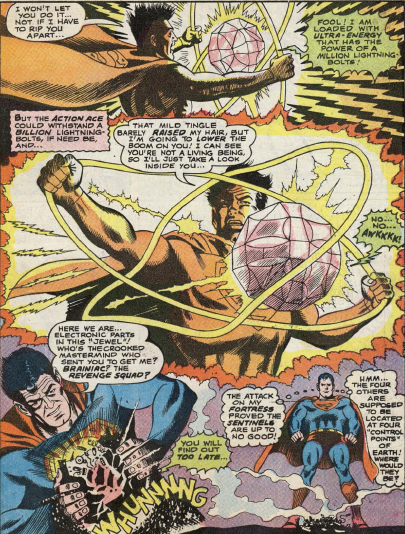 Zha-Vam taunts and toys with Superman through much of this issue. He is wearing a belt that temporarily gives himthe powers of other mythological beings. 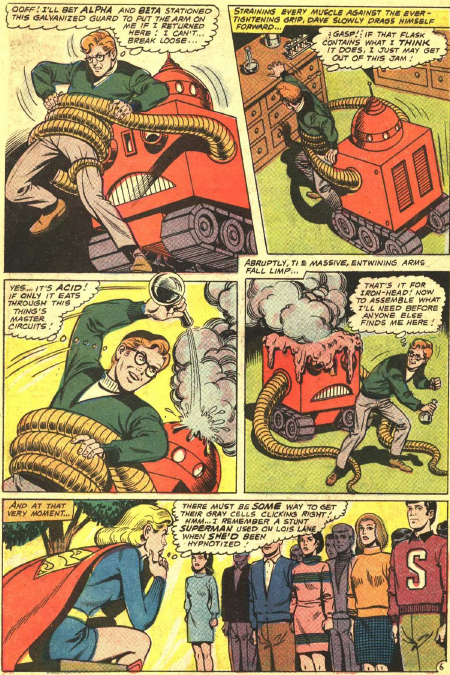 He makes Superman press his belt, and gains the serpentine hair of Medusa, freezing Superman to stone. 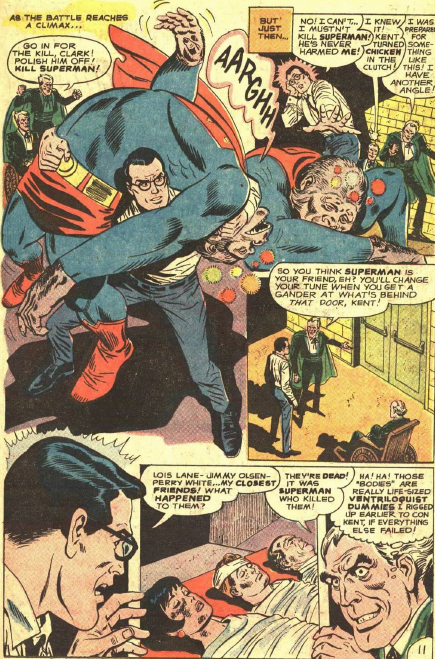 Lois Lane helps Superman get out of that one, but the next button he presses gives Zha-Vam Morpheus’ powers, and puts Superman to sleep. 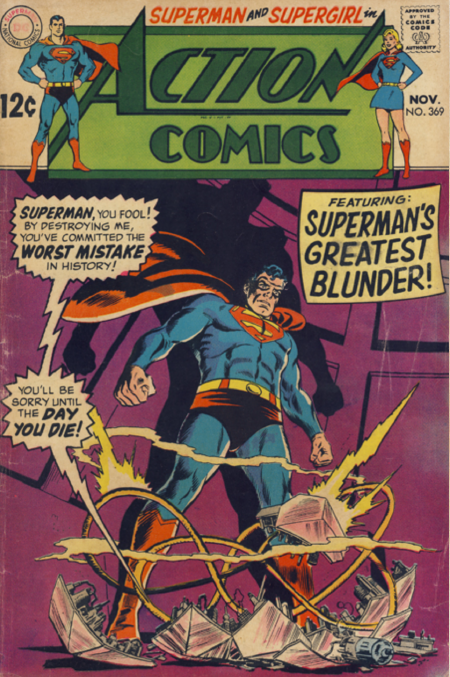 The only thing that really drives this chapter is Superman’s refusal to give in, as he just keeps trying and trying, and failing every time. 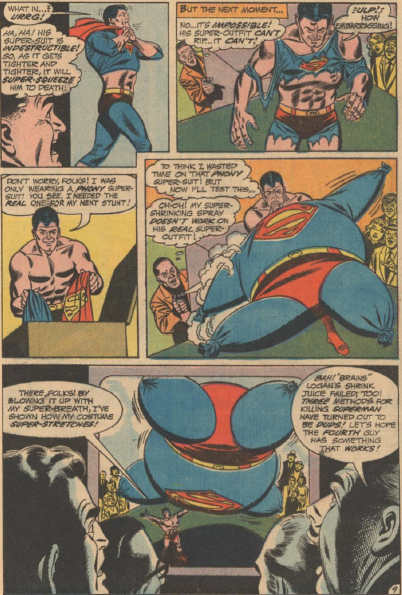 Superman even resorts to some underhanded measures by the end of the tale. 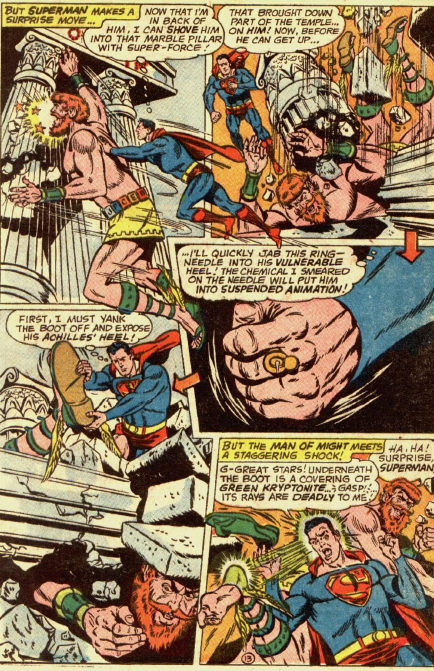 He gets himself a ring with a paralysis drug in it, and intends to jab Zha-Vam in his Achilles Heel. But Zha-Vam has kryptonite feet! Of course he does.